New computer, took me ages and a lesson from the other half to get these uploaded. Nothing to say for the last month or so, other stuff filling up my headspace, its been a difficult few months. Anyway some new work to keep me and my thoughts occupied. This is the second piece of work for the eco textile exhibition I am taking part in at The Quilt Show in the NEC in Birmingham next year. All naturally dyed yarns and fabrics. Old sheets, Shetland lambs wool and nettle yarns. I am hoping to add some seeds, bark and shells later. It was a beautiful morning so the dye pot had to make an appearance. I had planted a eucalyptus in the garden about three years ago, it wasn't happy but this year it has really taken off. I don't want it growing large so I pruned it yesterday, probably the wrong time of the year but it needs holding back a bit. My garden isn't huge. Anyway three scarves in the pot, two silk jersey cowls and one cotton scarf. My studio table is looking a mess, my excuse is that this is all work related and actually most of it is. I am now on Instagram, twice accidentally and I don't know how to remove the wrong one, I think you will find me under djpawle, still learning this slightly mysterious to me app, I don't think I am ever going to become tech savvy, I am also on Pinterest twice, how did I do that? Yesterday I went to a talk by an artist I have only recently discovered Jenny Leigh. I think many of you who look at my blog would like her work. Her talk was fascinating and very moving as is her work. Check her out at https://www.jennyleigh.co.uk/ Its her more recent work on totems and tokens of gratitude that I am particularly drawn to. My contribution to the Gardens of the Heart project by India Flint for h.ART. 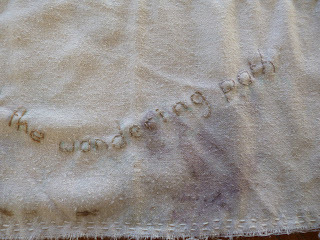 My line says 'and through the wood the wandering path'. Each participant is stitching a line of poetry, which will be stitched together with two other lines to make a three line poem. None of us know the contributions of others the results should be fascinating. I am just starting on a new driftwood piece, it occurred to me that I don't take photos of what the pieces look like before the clean up so here are a few pictures. wet. There are odd spots of green mould. 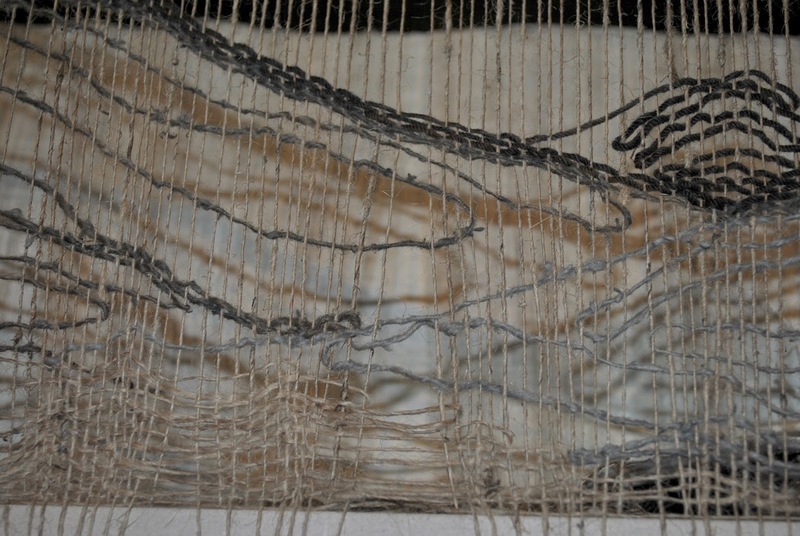 I am weaving some of the fibrous bits on a very small loom while they are still damp, an experiment. There after photos may not appear for some time, it will depend on weather and my available time. 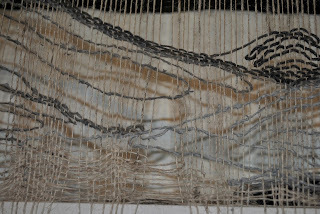 Both pieces will probably go in next year's West Country Quilt and Textile show at the end of August.